South Korea’s Constitutional Court on Friday ruled unanimously to remove President Park Geun-hye from office, the capstone of a sweeping corruption scandal that has engulfed the country for months. “Hereby, in a unanimous decision, the court issues the verdict: the court rules to expel President Park Geun-hye,” acting Chief Justice Lee Jung-mi said in a nationally televised ruling. With the decision, which is final and unchallengeable, Park has become the nation’s first democratically elected leader to be ousted by impeachment. The nation now must hold a presidential election within 60 days, making it likely to fall on May 9. Prime Minister Hwang Kyo-ahn, who has been substituing for Park since her parliamentary impeachment on Dec. 9, will continue to lead the nation until the next leader is elected. “Her violations of the law betrayed the public trust and they are too serious to be tolerated for the sake of protecting the Constitution,” said Lee who read out the verdict. Park had abused her presidential authority to help her longtime confidante Choi Soon-sil, who holds no government post, pursue personal gains, she added. Choi’s meddling in state affairs was extensive throughout Park’s entire time in office, and Park even attempted to conceal her wrongdoings when the scandal laid them bare. “The interest of guarding the Constitution by firing her is judged to be overwhelmingly great,” she concluded. Park offered no message of concession. Her Liberty Korea Party, however, accepted the decision and apologized to the public for its failure to assist the president as the ruling party. Violence erupted near the court, as thousands of staunch Park supporters protested the ruling. They angrily reacted, shouting, shedding tears and even hitting police officers. Two died of injuries while protesting and the causes of their deaths are still unknown, the police said. Acting President Hwang, in a public statement, called on both supporters and opponents of the ousted Park to accept the ruling and restore national unity. Park was impeached on a total of 13 charges, which the court bundled into five categories -- bribery, abuse of authority, Choi’s manipulation of power behind the scenes, failure to protect people’s lives and violation of press freedom. The court recognized Park’s active involvement in leaking government secrets to Choi and assisting Choi’s profit-making activities through public entities. But it did not acknowledge Park’s other charges -- her abuse of authority in sacking officials not in Choi’s favor, her negligence of duty in protecting people’s lives during the Sewol ferry disaster and her crackdown on press freedom. The parliament, which served as the prosecution in the impeachment trial, hailed the decision, adding the nation should now stand united. “I believe that the ruling confirmed the rule of law and people’s sovereignty, which embodies that every person, even the president, is equal before the law. The owner of the country is the people, and all power comes from the people,” said Kwon Seong-dong, the chairman of the parliamentary legislation and judiciary committee. “Those who held candles or national flags, they are all our people who we should respect and love. There is no victor or loser in this case,” he added. President Park, who did not turn up at the courtroom throughout the trial, also did not attend the verdict hearing. She reportedly watched the ruling via TV at her residence in the presidential office. 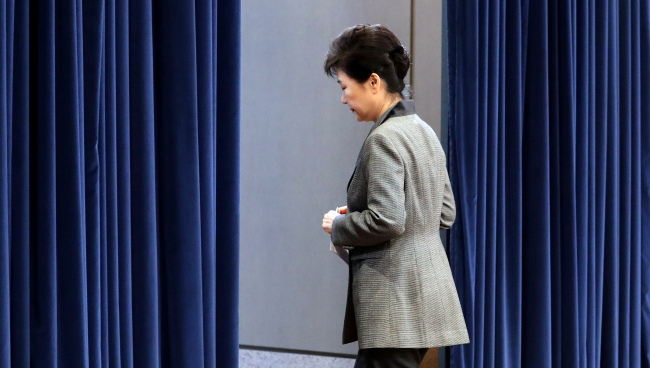 Park’s departure is unlikely to put an end to the monthslong crisis, which has caused the country to become deeply divided on generational and ideological lines in the face of the conservative leader’s impeachment. While opponents of Park gear up to hold a rally to celebrate the result Saturday, Park’s die-hard supporters are set to pour onto the streets to condemn the top court. Tensions ran high from Thursday evening near the court, as avid protestors for and against former President Park staged rallies in front of the building in last-bid attempts to make their voices heard. The police raised the level of alert to its highest Friday, dispatching all forces available to mobilize in the nation’s capital. Scores of police buses and some 21,600 officers formed lines to cordon off the court and government offices from mass protests and possible eruptions of violence.